Hindustan Times Chandigarh, 18 June 2017. Hindustan Times Mumbai, 18 June 2017. 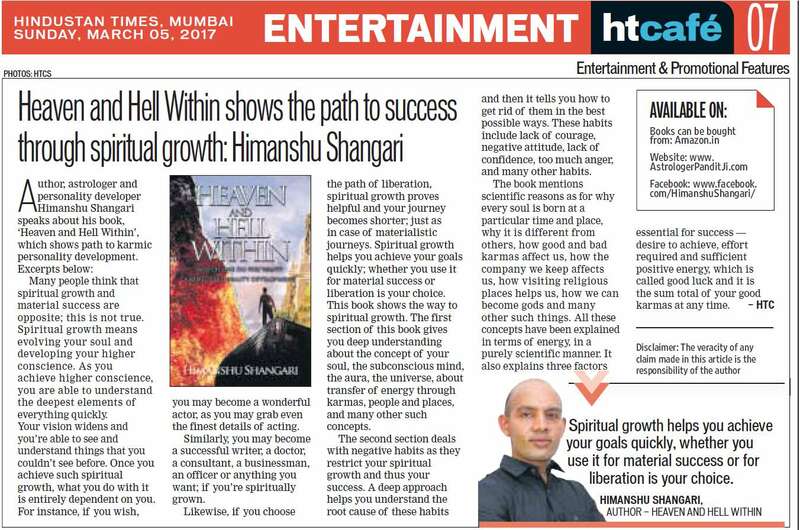 Himanshu Shangari News coverage for Heaven and Hell Within 03. 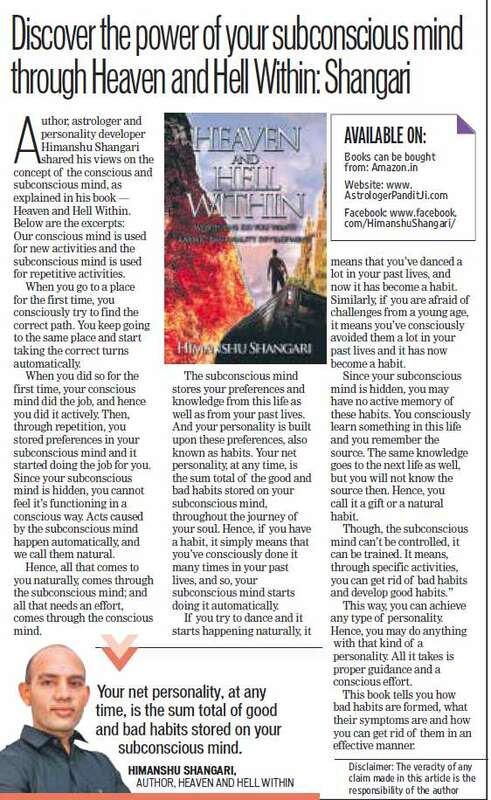 ‘Witness your intellect from inside and learn to grow it, Himanshu in ‘Heaven and Hell Within Part 3’. 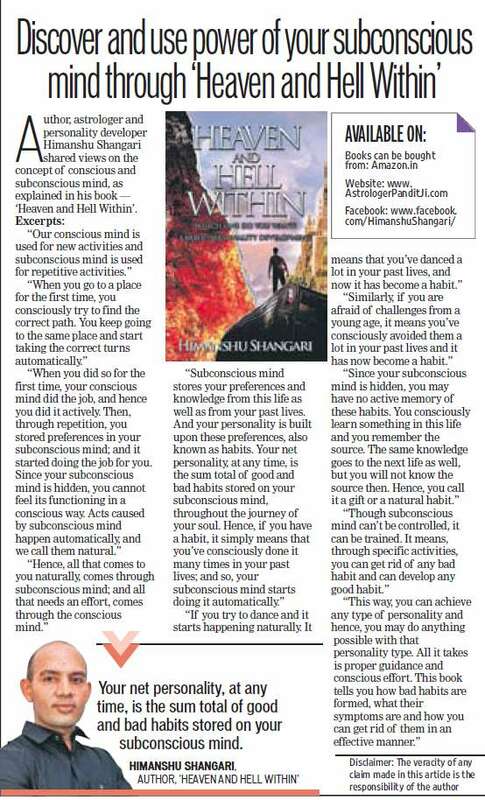 Author, Astrologer and Personality Developer Himanshu Shangari shared some thoughts on the concept of intellect, as explained in his book ‘Heaven and Hell Within 03’. ‘The personality of each human being at any time is the resultant of interactions of four important entities within him or her and these entities are intellect, heart, ego and conscience. All these entities exist within us, in different strengths and they have different characteristics or roles. Whenever we come across any situation; these entities start guiding us as to how we should deal with such situation’. ‘Different people witness these entities with different strengths depending on the journeys of their souls so far. Whichever entity is the strongest among these four in case of a person; such entity influences him the most and hence his decisions or acts have signatures of that entity’. ‘People who have intellect much stronger than heart, ego or conscience tend to benefit a lot in the fields which require the application of intellect, more than that of any other entity. However, the same people tend to suffer in fields which require the application of heart, to give good results; as they may use intellect instead of using heart in these fields’. ‘Hence people ruled by intellect may do well in anything dealing with knowledge and application of knowledge of any type. On the other hand, they may fail to do well in personal life because relationships are ruled by heart and hence the use of intellect in this field brings bad result in general’. ‘There’s a strong conflict between intellect and heart; just like the conflict between ego and conscience. This book features the working of intellect, how you can grow more intellect; how you can benefit more through it, where and how you should avoid its use as doing so may create problems; and a number of other facts related to the intellect’. ‘The book features a number of real life situations and it tells you how different type of people handle them. It means how you handle a situation if you’re ruled by intellect; heart, ego or conscience. Advanced study of human behavior as well as spiritual growth is featured in this book and it goes deep in human psychology’. ‘The fourth part of this series will deal with the heart and it will explain amazing facts related to the working as well as those related to the true potential of human heart’. Hindustan Times Chandigarh, 30 April 2017. Hindustan Times Mumbai, 30 April 2017. 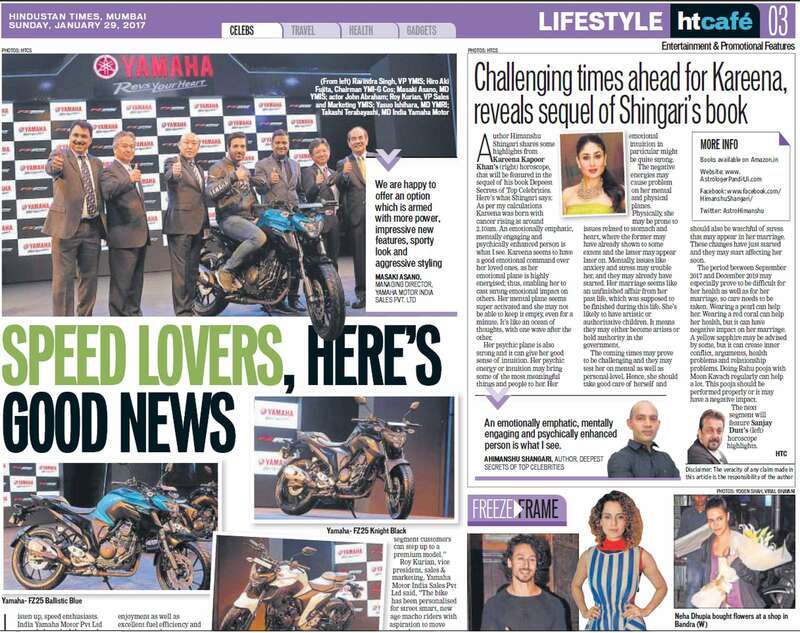 Himanshu Shangari News coverage for Deepest Secrets of Celebrities. 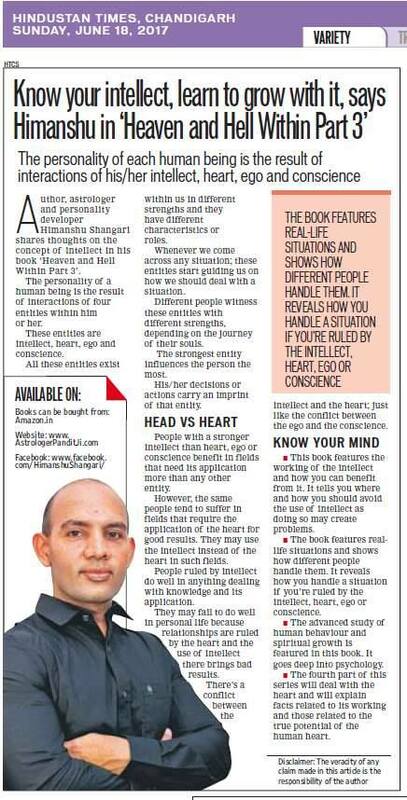 Author Himanshu Shangari shared highlights from Aamir Khan’s horoscope, featured in the third part of his book ‘Deepest Secrets of Celebrities’. ‘Aamir is born with Aquarius rising at 6:14 AM. It is the horoscope of a person who may be intellectual, spiritual, sensitive, private, kind, helpful, emotionally vulnerable, impulsive, and at times misunderstood. ‘He may be fond of learning new things and helping other people out. His mental plane is well equipped and it may give him good understanding of deeper aspects of many things. He may take interest in concepts like planets and universe as well as in the mechanism of different things. Hence he may spend significant amount of free time in quest of knowledge’. ‘His emotional plane is the most difficult to handle among all five planes and his emotional impulses may land him into troubles, many times in his life. He may have deep attachment with home and family; and he may enjoy relaxing and partying at home, instead of going out to public places. He may love privacy and hence he may not like doing private things in public places’. His spiritual growth also looks good though many people may not understand it. For him, being spiritual may mean respecting, understanding and caring for people in need and trying to make this world a better place to live. The time till September 2019 looks good though the period between August 2017 and August 2018 may bring some upsets on family and financial fronts. September 2019 may mark the beginning of a new time zone which may put pressure on him, especially emotional pressure. Thus he may face problems on family front as well as other problems of personal type and such problems may affect his health in negative way. Hence he should take care’. Wearing a White Sapphire can help him a lot. He may be advised to wear a Blue Sapphire or an Emerald but he should avoid them as they can cause harm if worn. Hindustan Times Chandigarh, 09 April 2017. Hindustan Times Mumbai, 09 April 2017. Author Himanshu Shangari shared highlights from Angelina Jolie’s horoscope, featured in the third part of his book ‘Deepest Secrets of Celebrities’. ‘Angelina is born with Cancer rising. It is a rare type of horoscope as it features strong energies influencing her physical, mental, emotional and psychic planes. As a result, she may have an enhanced personality and she may be gifted physically, mentally, emotionally as well as psychically’. ‘It is the horoscope of a beautiful, intellectual, emotional, sensitive, kind and intuitive person and this is what makes it special. It is difficult to find people who are intellectual and intuitive at the same time as both these energies don’t go well with each other in general. Hence intellectual people may not be intuitive and vice versa in general’. ‘However, she may carry both these energies very well and hence she is special. Her sharp intellect can help her achieve a lot in her professional life, her beautiful heart can help her do and enjoy great things in her personal life and her psychic abilities may help her mesmerize and control people as if by magic. Her psychic energy can make you do things she wants and you may not even know why’. ‘Significant spiritual growth from past lives may encourage her to engage in selfless acts of kindness. The influence of divine energies is strong in her horoscope, which can help her a lot. She may feel the presence of a guardian angel with her, almost throughout her life. This divine energy may get her out of troubles and it may create miracles, many times in her life. Her horoscope indicates an upward pattern of spiritual growth, which means she may carry great amount of positive energy to her next life, through good karmas done in this life’. ‘A man may appear in her life between October 2017 and December 2018 and this relationship may become a significant one. The period after October may also bring some health issues and they may trouble her if not attended to in time. Professional scope looks good for the coming times and hence she should do well in this field’. ‘Wearing a Pearl can help her achieve better results in her life. A Red Coral or a Yellow Sapphire may be advised but they should be avoided as they can cause harm’. Aamir Khan’s Horoscope highlights in next segment. Hindustan Times Chandigarh, 19 March 2017. Hindustan Times Mumbai, 19 March 2017. 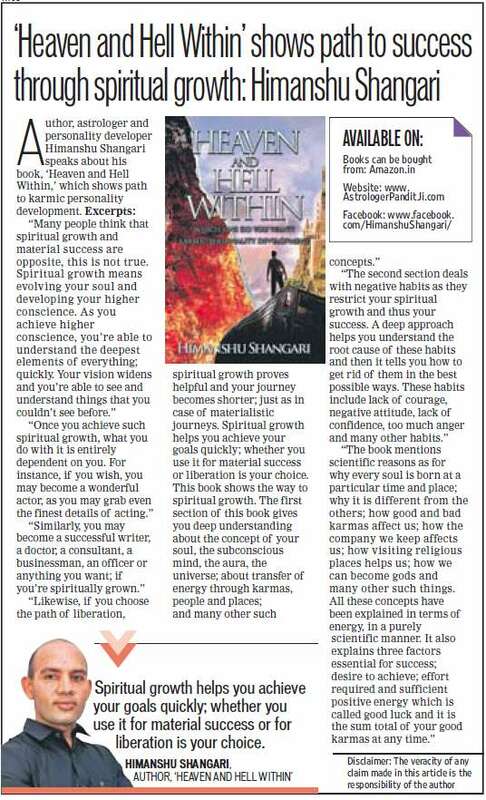 Himanshu Shangari News coverage for Heaven and Hell Within. ‘Discover and use the amazing power of your subconscious mind through ‘Heaven and Hell Within’. ‘Our conscious mind is used for new activities and our subconscious mind is used for repetitive activities. You go to a place first time; you consciously try to find the correct path. You keep going to the same place and you start taking the correct turns automatically. When you did so first time, your conscious mind did this job and hence you did it actively’. ‘Through repetition, you stored preferences on your subconscious mind and it started doing this job for you. Since your subconscious mind is the hidden one, you can’t feel its functioning in a conscious way. These acts happen automatically and we call them natural. Hence all that comes to you naturally; comes through subconscious mind and all that needs effort; comes through conscious mind’. ‘Subconscious mind stores your preferences and knowledge from this life as well as from past lives and your personality is built upon these preferences called habits. Your net personality at any time is the sum total of good and bad habits stored on your subconscious mind throughout the journey of your soul. Hence if you have a habit, it simply means you’ve consciously done it a lot in your past lives and so your subconscious mind starts doing it automatically’. ‘You try to dance and it all starts happening naturally. It means you’ve danced in lot in your past lives and it has become a habit. You’re afraid of challenges from young age, it means you’ve consciously avoided them a lot in your past lives and it too has become a habit. Since subconscious mind is hidden, you may have no active memory of these habits. You consciously learn something in this life and you remember the source. The same knowledge goes to next life also, but you won’t know the source then. Hence you call it gifted or natural. ‘Though subconscious mind can’t be controlled, it can be trained. It means through specific activities, you can get rid of any bad habit and you can develop any good habit. This way, you can achieve any type of personality and hence you may do anything possible with that personality type. All it takes is proper guidance and conscious effort. This book tells you how various bad habits form, what their symptoms are and how to get rid of them in an effective manner’. Hindustan Times Chandigarh, 12 March 2017. Hindustan Times Mumbai, 12 March 2017. 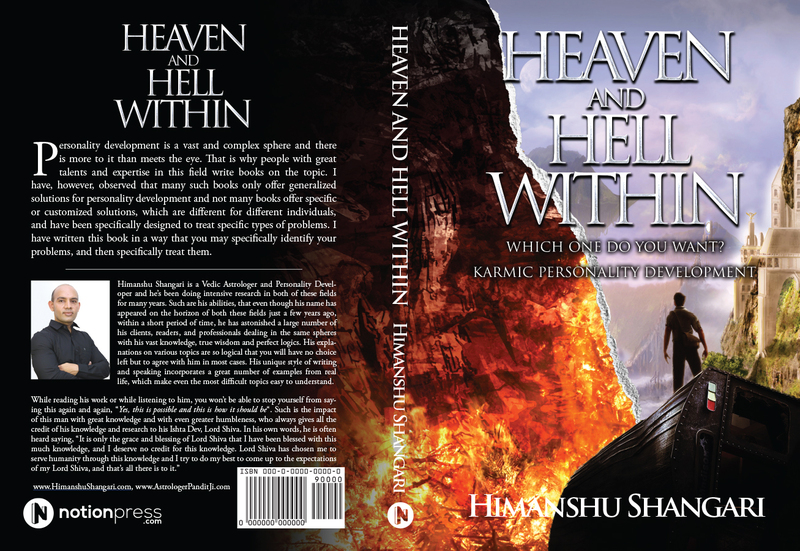 ‘Your Aura is the sum total of your soul’s journey so far, Himanshu in ‘Heaven and Hell Within. 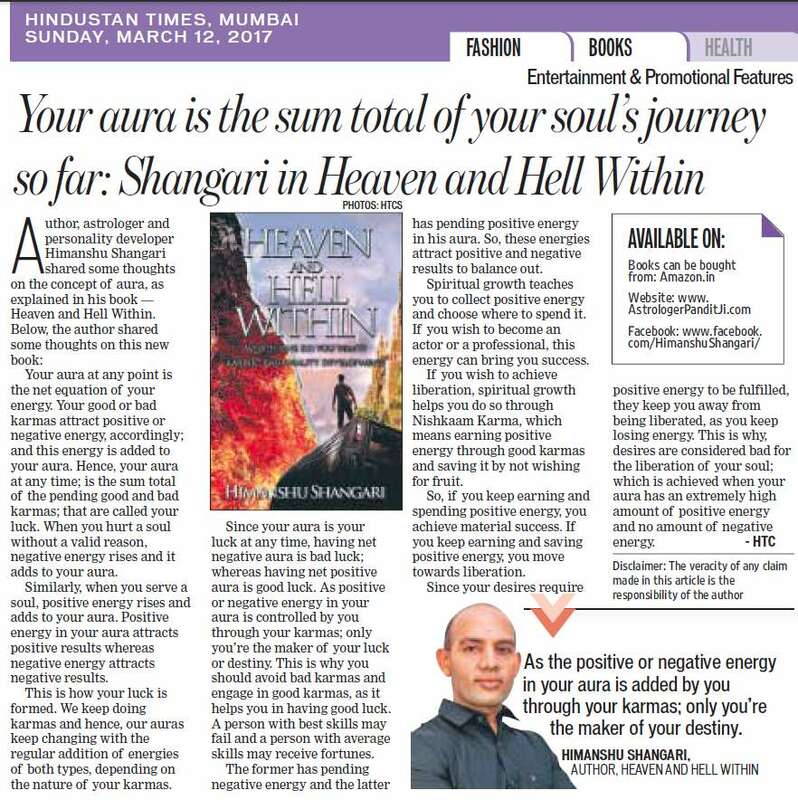 Author, Astrologer and Personality Developer Himanshu Shangari shared some thoughts on the concept of aura, as explained in his book ‘Heaven and Hell Within’. ‘Your aura at any point is the net equation of energy. Your good or bad karmas attract positive or negative energy and this energy is added to your aura. Hence your aura at any time is the sum total of the pending good and bad karmas; called your luck’. ‘When you hurt a soul without valid reason, negative energy rises and it adds to your aura. When you serve a soul, positive energy rises and it adds to your aura. Positive energy in your aura attracts positive results whereas negative energy attracts negative results. This is how your luck is formed’. ‘We keep doing karmas and hence our auras keep changing due to regular addition of energies of both types, depending on the nature of our karmas. Since your aura is your luck at any time, having net negative aura is bad luck and having net positive aura is good luck. As the positive or negative energy in your aura is controlled by you through your karmas; only you’re the maker of your luck or destiny’. ‘This is why you should avoid bad karmas and engage in good karmas so that you may have good luck. A person with best skills may fail and a person with average skills may receive fortunes. The former has pending negative energy and the latter has pending positive energy in his aura. So these energies attract positive or negative results to balance out’. ‘Spiritual growth teaches you to collect positive energy and choose where to spend it. If you wish to become an actor or another professional, this energy can bring you success. If you wish to achieve liberation, spiritual growth helps you do so through Nishkaam Karma which means earning positive energy through good karmas and saving it by not wishing for fruit’. ‘So if you keep earning and spending positive energy, you achieve material success. If you keep earning and saving positive energy, you move towards liberation. Since your desires require positive energy to be fulfilled, they keep you away from being liberated as you keep losing energy. This is why desires are considered bad for liberation which is achieved when your aura has an extremely high amount of positive energy and no amount of negative energy. Hindustan Times Chandigarh, 5 March 2017. Hindustan Times Mumbai, 5 March 2017. 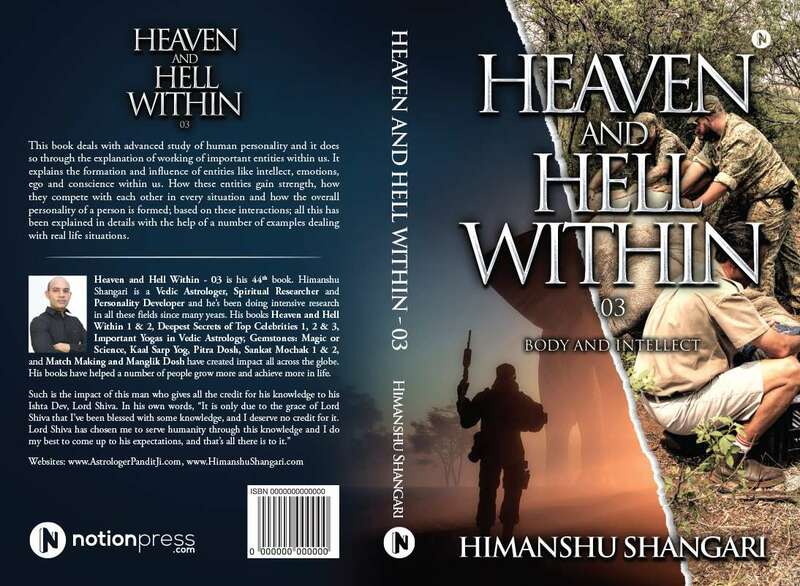 Himanshu Shangari News for Heaven and Hell Within. 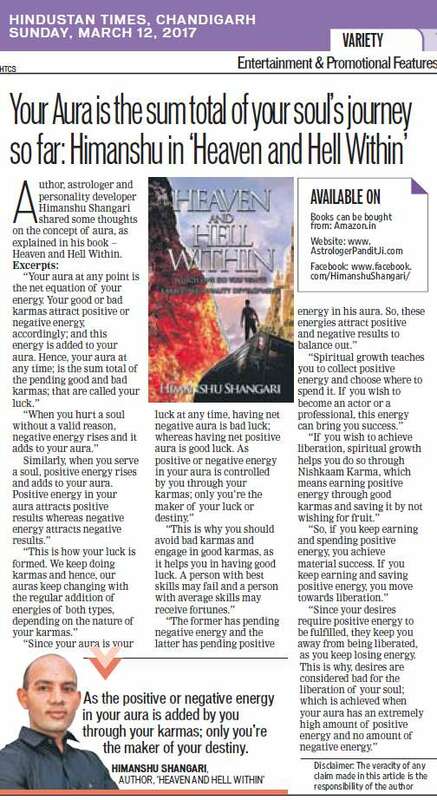 Author, Astrologer and Personality Developer Himanshu Shangari spoke about his well acclaimed book, ‘Heaven and Hell Within’ which shows the path to karmic personality development. ‘Many people think spiritual growth and material success are opposite, which is not true. Spiritual growth means evolving your soul and developing higher conscience. As you achieve higher conscience, you’re able to understand the deepest elements of everything; very quickly. Your vision widens and you’re able to see and understand things which you couldn’t see before. ‘Once you achieve such spiritual growth, what you do with it is entirely dependent on you. For instance, if you wish, you may become a wonderful actor as you may grab even the finest details of acting. Similarly, you may become a successful writer, doctor, consultant, businessman, officer or anything you want; if you’re spiritually grown’. ‘Likewise, if you choose the path of liberation, spiritual growth proves very helpful and your journey becomes shorter; just as in case of materialistic journeys. Spiritual growth helps you achieve your goals quickly; whether you use it for material success or liberation is your choice’. ‘This book shows the way to spiritual growth. The first section of this book gives you deep understanding about the concept of your soul, the subconscious mind, the aura, the universe, transfer of energy through karmas, people and places; and many other concepts’. ‘The second section deals with negative habits as they restrict your spiritual growth and thus your success. A very deep approach helps you understand the root cause of these habits and it then tells you how to get rid of them in the best possible ways. These habits include lack of courage, negative attitude, lack of confidence, too much anger and many other habits’. ‘The book mentions scientific reasons for why every soul is born at a particular time and place, why it is different from the others, how good and bad karmas affect us, how the company we keep affects us, how visiting religious places helps us, how we can become gods and many other such things. All these concepts have been explained in terms of energy, in a purely scientific manner. It also explains three factors essential for success; desire to achieve, effort required and sufficient positive energy which is called good luck and it is the sum total of your good karmas at any time ’. Hindustan Times Chandigarh, 26 February 2017. 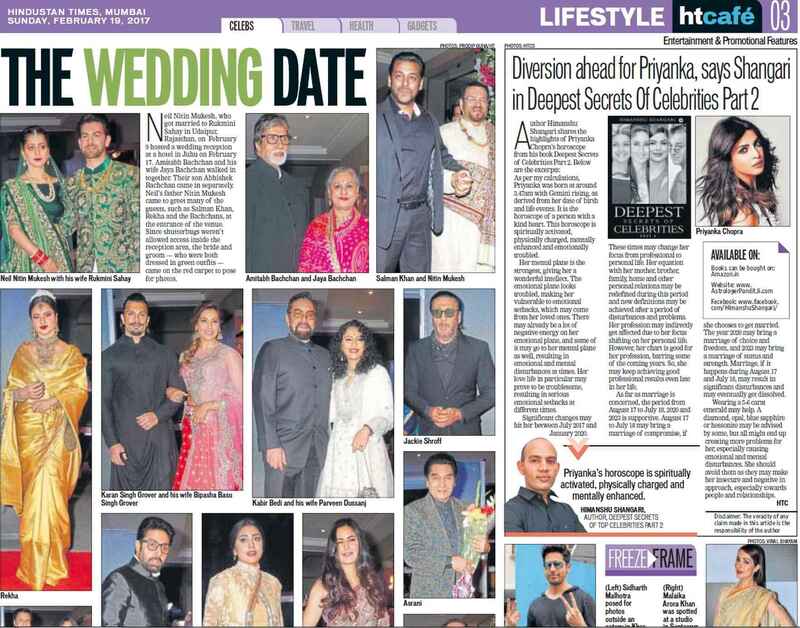 Hindustan Times Mumbai, 26 February 2017. 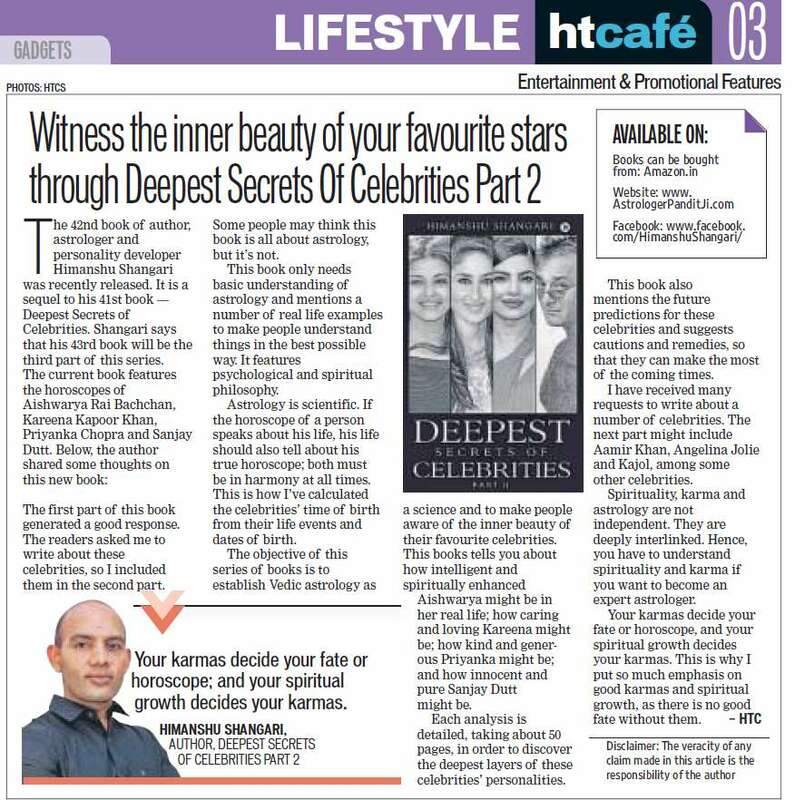 Himanshu Shangari News for launch of 42nd book, Deepest Secrets of Celebrities Part 2. 42nd book of Author, astrologer and personality developer Himanshu Shangari has released. This book is a sequel to his 41st book and it features horoscopes of Aishwarya Rai Bachchan, Kareena Kapoor Khan, Priyanka Chopra and Sanjay Dutt. The author shared some thoughts on this book. ‘The first part of this book generated very good response. The readers asked me to write about these celebrities and so I included them in this part. Some people may think this book is all about astrology, it is not so’. ‘This book only needs basic understanding of astrology and it mentions a number of real life examples to understand things in the best possible way. The book features a lot of psychological and spiritual philosophy’. ‘Astrology is perfectly scientific and nothing else. If the horoscope of a person tells about his life, his life should also tell about his true horoscope as both must be in harmony at all times. This is how I’ve calculated their times of birth from their life events and dates of birth’. ‘The objective of this series of books is to establish Vedic astrology as a science and to make people aware of the inner beauty of their favorite celebrities. This book tells you how intelligent and spiritually enhanced Aishwarya may be in her real life, how caring and loving Kareena may be, how kind and generous Priyanka may be and how innocent and pure Sanjay Dutt may be’. ‘Each analysis is detailed, taking about 50 pages, in order to discover the deepest layers of their personalities. This book also mentions future predictions for these celebrities and it suggests cautions and remedies too, so that they may make the most of the coming times’. The author says his 43rd book will be the third part of this series. ‘I have already received many requests to write about a number of celebrities. The next part may include Aamir Khan, Angelina Jolie and Kajol Devgan; among some other celebrities’, he adds. ‘Spirituality, karma and astrology are not independent and they are deeply interlinked. Hence you have to understand spirituality and karma if you want to become an expert astrologer. Your karmas decide your fate or horoscope and your spiritual growth decides your karmas. This is why I put so much emphasis on good karmas and spiritual growth, as there is no good fate without them’, the author concludes. Hindustan Times Chandigarh, 19 February 2017. Hindustan Times Mumbai, 19 February 2017. Himanshu Shangari News for Priyanka Chopra’s Horoscope Analysis and Predictions. Diversion ahead for Priyanka, Himanshu in ‘Deepest Secrets of Celebrities Part 2’. 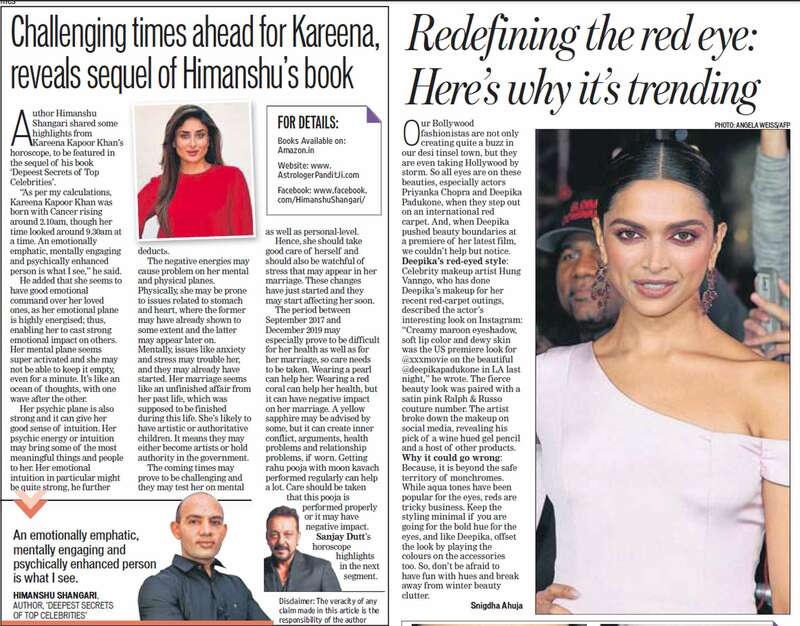 Author Himanshu Shangari shared highlights from Priyanka Chopra’s horoscope, featured in his book ‘Deepest Secrets of Celebrities 02’. “As per my calculations, she’s born around 3:47 AM with Gemini rising, as derived from her date of birth and her life events. It is the horoscope of a person with a kind and beautiful heart. This horoscope is spiritually activated, physically charged, mentally enhanced and emotionally troubled. Her mental plane is the strongest, giving her wonderful intellect. The emotional plane looks troubled, making her vulnerable to emotional setbacks, which may come from her loved ones”. “There may already be a lot of negative energy on her emotional plane and some of it may go to her mental plane also; resulting in emotional and mental disturbances at times. Love life in particular may prove troublesome, resulting in serious emotional setbacks at different times”. “Significant changes may hit her during July 2017 and January 2020. These times may change her focus from profession to personal life. Her equation with her mother, brother, family, home and personal relations may be redefined during this period and the new definitions may be achieved after a period of disturbances and problems”. “Her profession may also get affected indirectly, due to her focus shifting on personal life. However, her chart is very good for profession and barring some of the coming years, she may keep achieving very good professional results till late in her life”. “For marriage, the periods of August 17 to July 18, 2020 and 2023 are supportive. August 17 to July 18 may bring a marriage of compromise if she chooses to get married there, year 2020 may bring a marriage of choice and freedom; and 2023 year may bring a marriage of status and strength. Marriage, if it happens during August 17-July 18, may result in significant disturbances and may eventually get dissolved”. “Wearing a 5-6 carat Emerald may help in many ways. A Diamond, Opel, Blue Sapphire or Hessonite may be advised by some, all of them may end up creating more problems, especially more emotional and mental disturbances. Hence she should avoid them, as they may make her insecure and negative in approach, especially towards people and relationships”. Hindustan Times Chandigarh, 5 February 2017. Hindustan Times Mumbai, 5 February 2017. 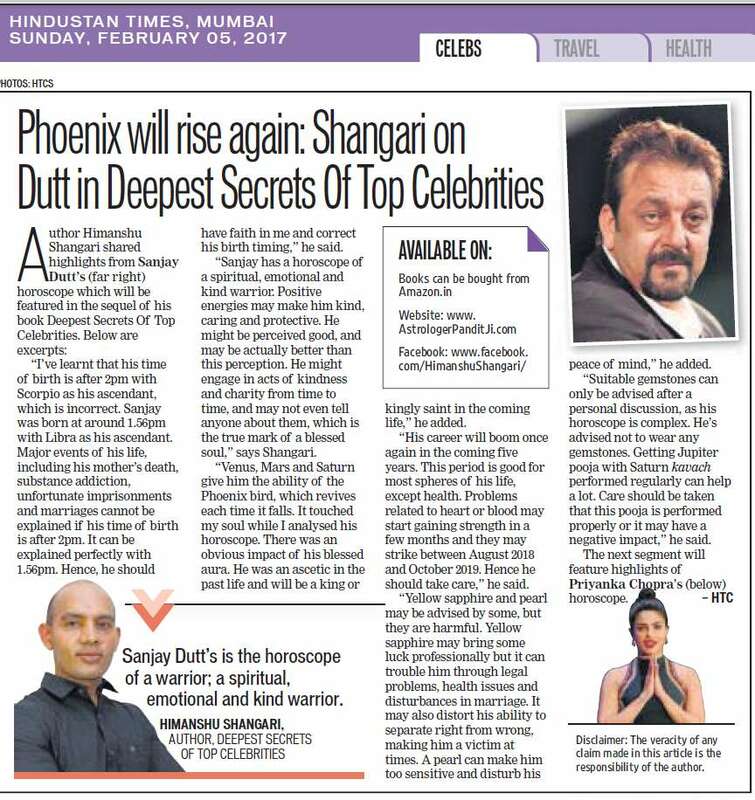 Himanshu Shangari News for Sanjay Dutt’s Horoscope Analysis and Predictions. The Phoenix will rise again, says Himanshu about Sanjay Dutt. 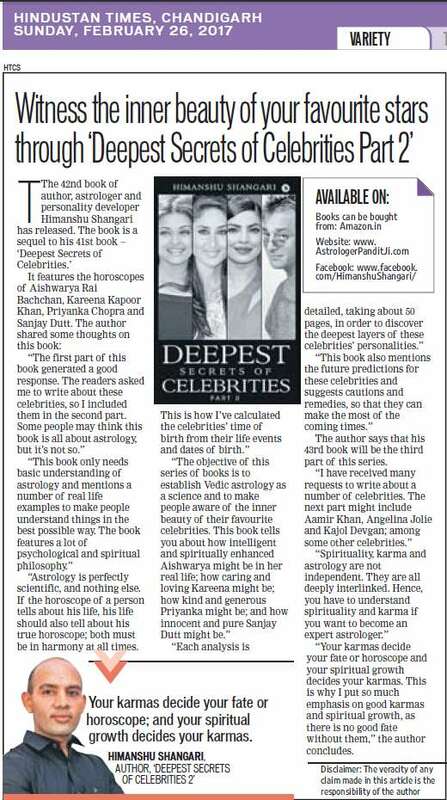 Author Himanshu Shangari shared highlights from Sanjay Dutt’s horoscope, to be featured in the sequel of his book ‘Deepest Secrets of Top Celebrities’. “I’ve learned he has his time of birth after 2 PM with Scorpio as his ascendant, which is incorrect. Sanjay Dutt was born around 1:56 PM with Libra as his ascendant, and that’s for sure. Major events of his life like his mother, substance addiction, unfortunate imprisonments and marriages are not explained after 2 PM and they’re explained perfectly with 1:56 PM. Hence he should have faith in me and correct his birth time”, he said. “It is the horoscope of a warrior; a spiritual, emotional and kind warrior. Positive energies may make him kind, caring and protective. He may be perceived good and he may actually be even better than this perception. He may engage in acts of kindness and charity from time to time, and he may not even tell anyone about them; the true mark of a blessed soul”, says Himanshu. “Venus, Mars and Saturn give him the ability of the Phoenix bird, which may revive him each time he falls. It felt like he touched my soul while I was analyzing his horoscope, an obvious impact of his blessed aura. An ascetic in the past life and a king or kingly saint in the coming life”, he added. “His career will boom once again in the coming 5 years and this period is good for most spheres of his life, except his health. Problems related to heart or blood may start gaining strength after a few months and they may strike between August 2018 and October 2019. Hence he should take care”. “Suitable gemstones can only be advised after a personal discussion as his horoscope is complex. He’s advised not to wear any gemstones. Getting Jupiter Pooja with Saturn Kavach performed regularly can help a lot. Care should be taken that this Pooja is performed properly or it may have negative impact”. Himanshu Shangari News for Kareena Kapoor Khan’s Horoscope Analysis and Predictions. The author shared some highlights from Kareena Kapoor Khan’s horoscope, to be featured in the sequel of his book. As per my calculations, she’s born with Cancer rising around 2:10 AM, though her time looked around 9:30 AM at a time. An emotionally emphatic, mentally engaging and psychically enhanced person is what I see. She seems to have good emotional command over her loved ones as her emotional plane is highly energized, enabling her to cast strong emotional impacts. The mental plane seems super activated and she may not be able to keep it empty, even for a minute. It’s like an ocean of thoughts, with one wave after the other. The psychic plane is also strong and it can give her good sense of intuition. Her psychic energy or intuition may bring some of the most meaningful things and people to her. Her emotional intuition in particular may be very strong. The negative energies may cause problems on her mental and physical planes. Physically, she may be prone to issues related to stomach and heart, where the former may have already shown to some extent and the latter may appear later on. Mentally, issues like anxiety and stress may trouble her, and they may already have started. Her marriage seems an unfinished affair from her past life, which was supposed to be finished during this life. She’s likely to have artistic or authoritative children. It means they may become artists or hold authority in government. The coming times may prove challenging and they may test her on mental as well as on personal level. Hence she should take good care of herself and she should also be watchful of the stress that may appear in her marriage. These changes have just started and they may start affecting her soon. The period between September 2017 and December 2019 may especially prove difficult for her health as well as for marriage, so care needs to be taken. Wearing a Pearl can help her. Wearing a Red Coral can help her health but it can have negative impact on her marriage. A Yellow Sapphire may be advised by some, but it can create inner conflict, arguments, health problems and relationship problems, if worn. Getting Rahu Pooja with Moon Kavach performed regularly can help a lot. Care should be taken that this Pooja is performed properly or it may have negative impact.